Our Premium version allows you to customize the appearance of shifts on the web calendar (shifts will not be affected in the app). 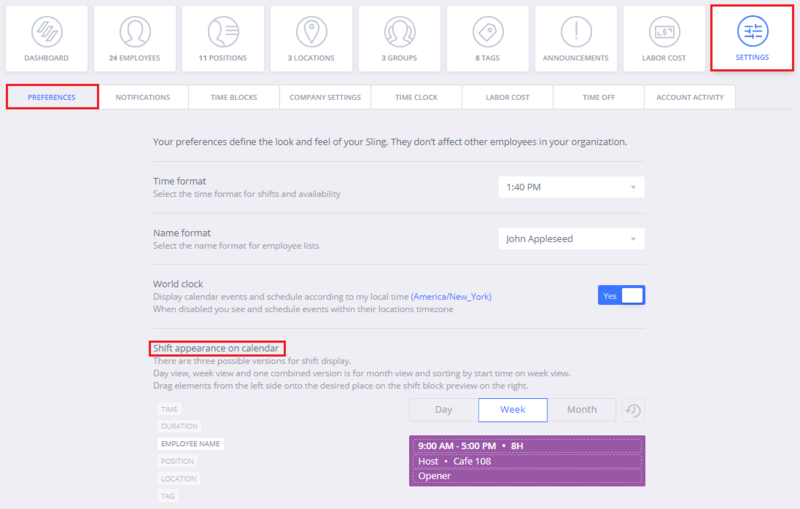 These settings are unique to each user, so an admin's settings will not affect the appearance of employees' views. This way, each user can customize their view to their own liking. Go to Dashboard > Settings > Preferences and find the section labeled, Shift appearance on calendar. The labels on the left are the bits of info you can add, remove, or rearrange by dragging and dropping. For example, if you want to remove the shift duration, simply drag it and drop it to the left side. The purple area shows you how the info will look within a shift on the calendar. Note that there are different options for the different views and you can customize each one separately by highlighting the different view options (day, week, and month).